All Times after 10:00am each day are approximate, and based on entries. Open Practice, but equal drive to marshalling time will be enforced. All Classes - 2 x 10 Minute Qualifiers. At this point, Rocket Round (your best qualifier time, i.e. 18 / 10:12:133) will be used to seed for Mains. If we run a C, it's 1-run with 1-2 Bumps. The B's run twice, moto format, top 1-2 Bump into the AA. The A's run twice, moto format. Tiebreaker is motocross (2nd Moto Placing). Different Choices Daily at the Cookhouse! Must Book before July 4th for these savings. This is not only the nicest place in the area, it is also the closest! Thanks to the Blyth Inn for being our hosts and home away from home. You have several convenient options for pre-registration. Last year we had 72 entries and we're anticipating over 100. Everyone and anyone! 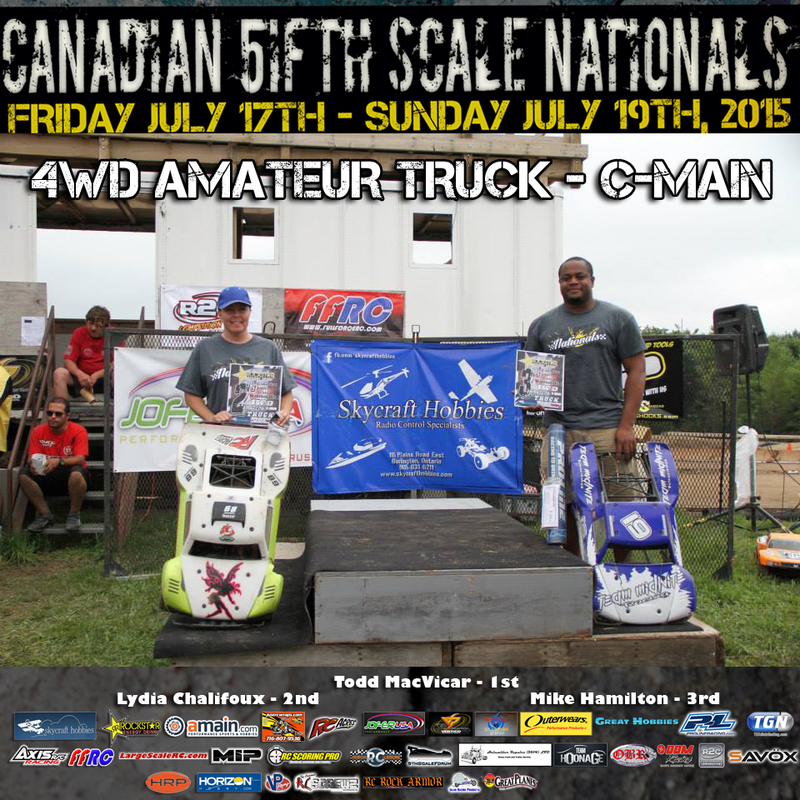 Welcome 5th Scale Forum as a Sponsor! We'd like to welcome our preliminary sponsors, and extend our thanks for their early support! 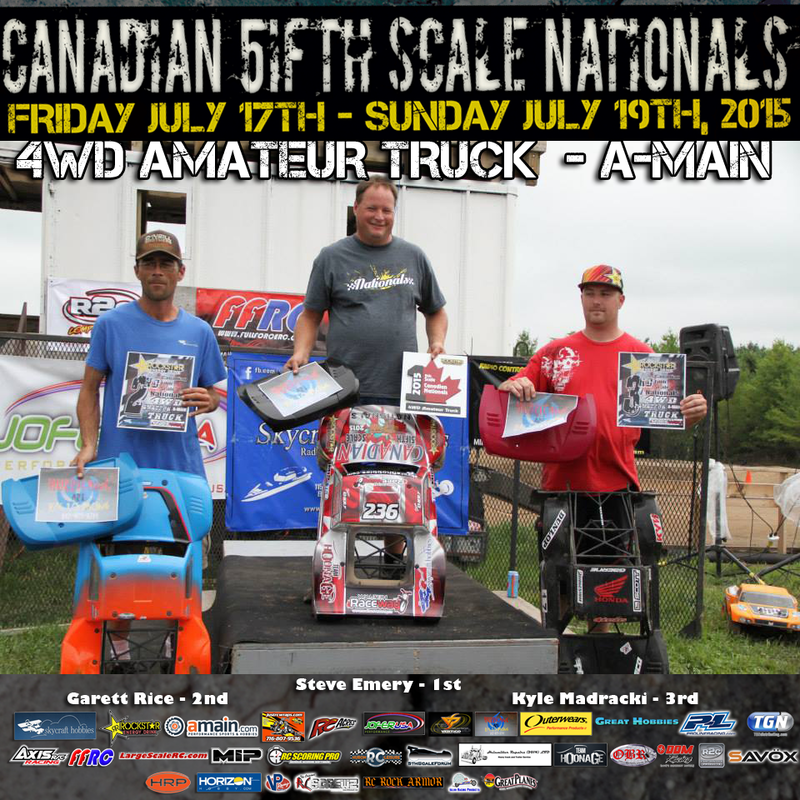 If at any time you need their products or services, please partronize those that made the 2015 Canadian 5ifth Scale Nationals a possibility! 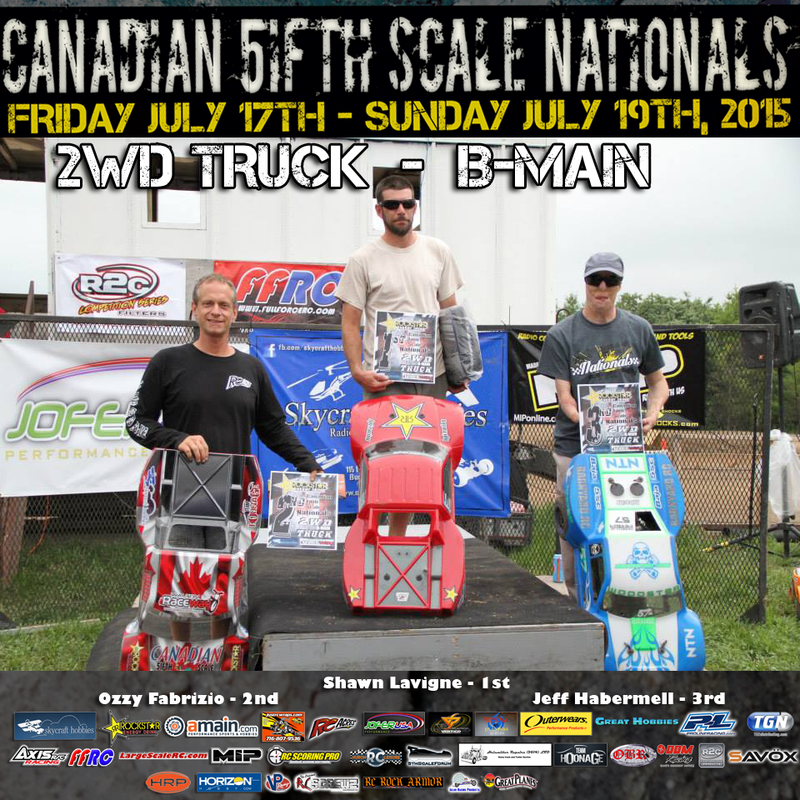 Skycraft Hobbies has partnered with Just Signs and Designs / Just RC Wraps to design some amazing commemorative wraps for the 2015 Canadian 5ifth Scale National. Skycraft is going to GIVEAWAY a WRAP and BODY to one lucky racer of each: 2WD BUGGY (either Pro or Amateur); 4WD TRUCK (either Pro or Amateur); and 2WD TRUCK. You just need to race to be eligible to win. 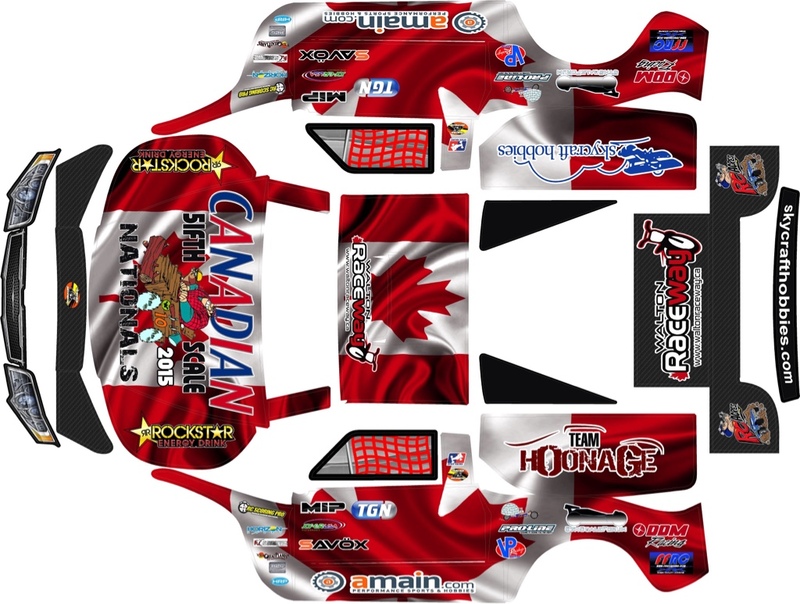 However, pre-orders are available, customized with your name & number on them, contact Andrew at Skycraft Hobbies 905-631-6211 www.SkycraftHobbies.com to order yours in time for the National! 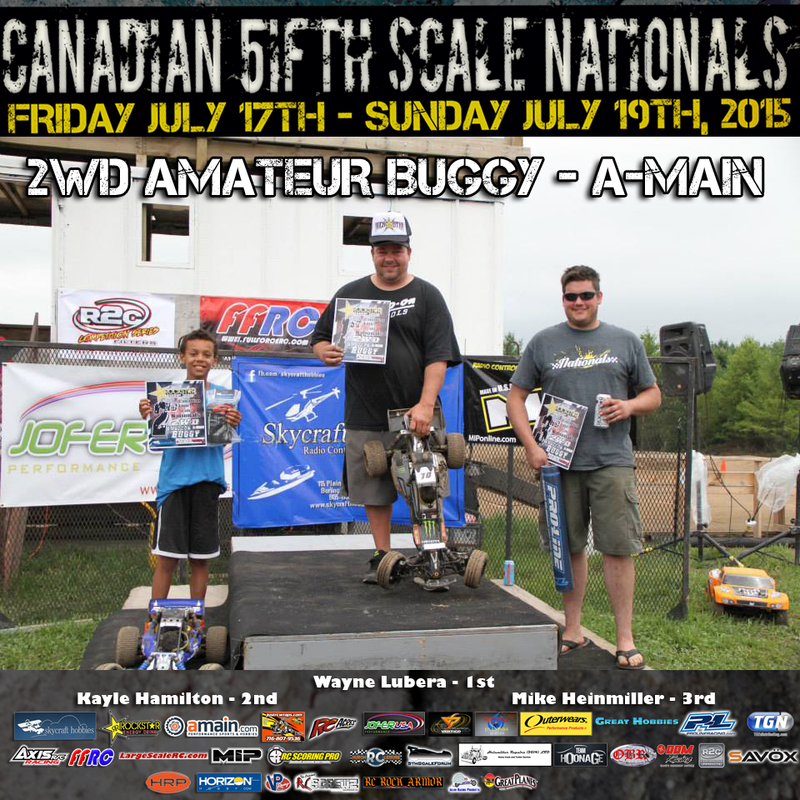 Pre-entries continue to pour in for the 2015 Canadian 5ifth Scale Nationals​ July 17-19. 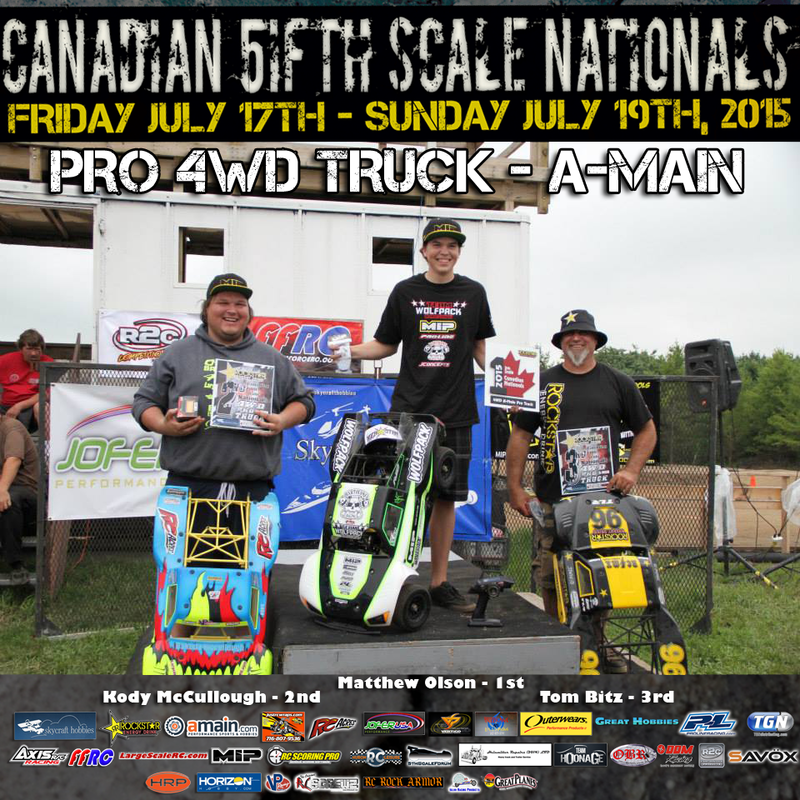 RC Signup: http://jscully.tk/2015nats OR Google Form: http://jscully.tk/2015natsform OR text/call 416.931.2502 OR email scully@joescully.com OR facebook message Joe Scully​ OR for series or returning racers, reply to this post with "put me in". We would like to show our 20+ Sponsors just how excited you are. 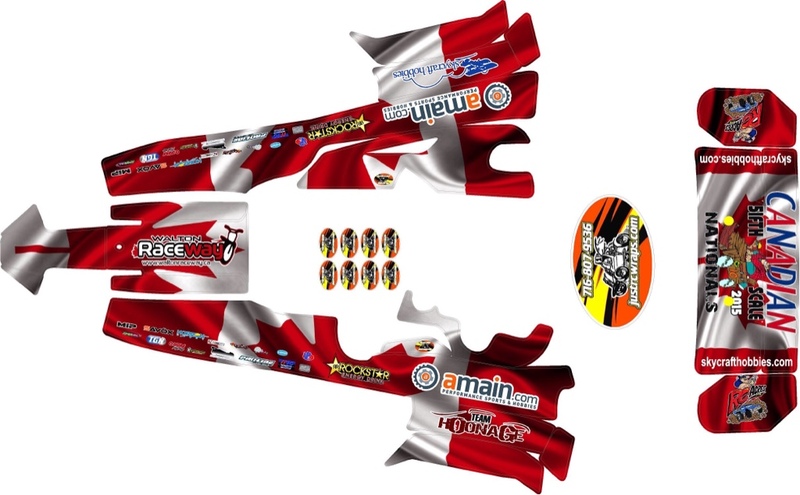 You may win a commemorative wrapped body just by racing! This national is a 3-day spectacular, and though some may not be able to make it Friday; there's still good news: we do "Open Practice" before "Controlled Practice" on Saturday. Last year, some racers were able to get 24 laps in during "Open Practice" on Saturday. And... those that can make it on Friday; last year we had one racer post 96 laps with 1 hour and 18 minutes of Track Time, (plus marshalling and wrenching). Before Controlled Practice started on Saturday, they had posted 115 Laps with 1 Hour and 32 Minutes of Track Time.... sounds like a record to beat! 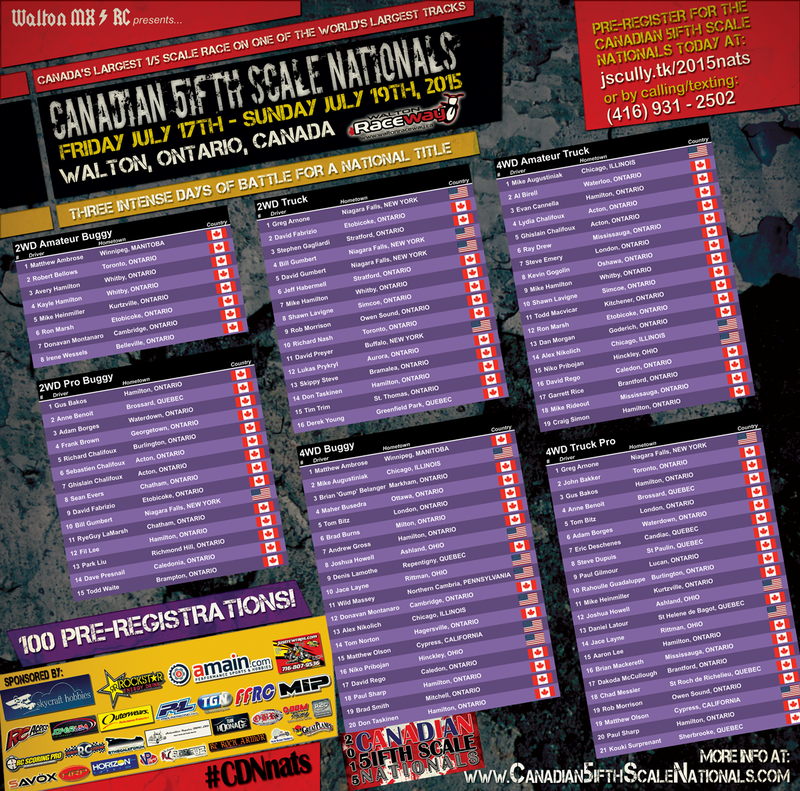 We're at 74 Entries... get those pre-registrations in! 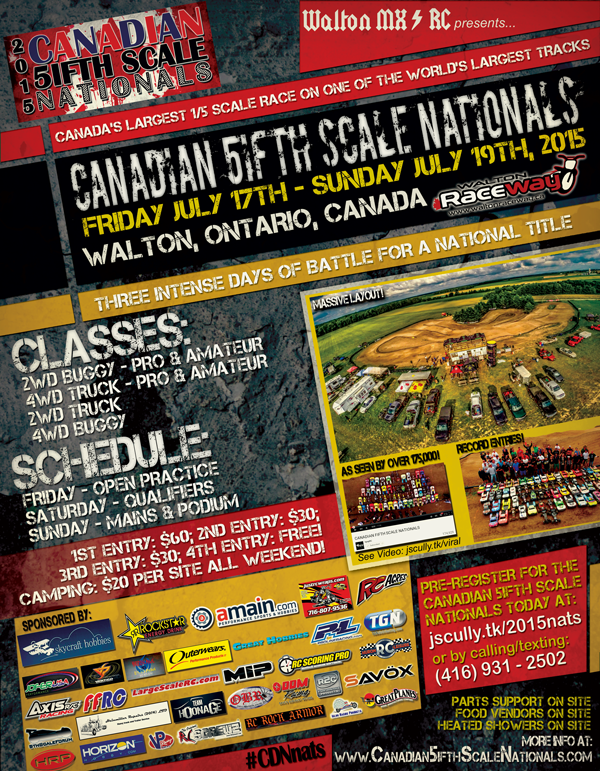 We're at 78 Pre-Registrations for the 2015 Canadian 5ifth Scale Nationals​ July 17-19!!! Our listing so far includes 14 American Entries from as far as California, and 64 Canadian Entries from as far as Manitoba, with 8 entries so far from Quebec. We would like to show our 24+ Sponsors just how excited you are. This national is a 3-day spectacular, and though some may not be able to make it Friday; there's still good news: we do "Open Practice" before "Controlled Practice" on Saturday. Last year, some racers were able to get 24 laps in during "Open Practice" on Saturday. And if for some reason Sunday is your only option to make it... talk with us and we can look at putting you at the back of the grid in the lowest main. However... those that can make it on Friday; last year we had one racer post 96 laps with 1 hour and 18 minutes of Track Time, (plus marshalling and wrenching). Before Controlled Practice started on Saturday, they had posted 115 Laps with 1 Hour and 32 Minutes of Track Time.... sounds like a record to beat! Ho-Lee! We're at 91 pre-registrations so far!!! 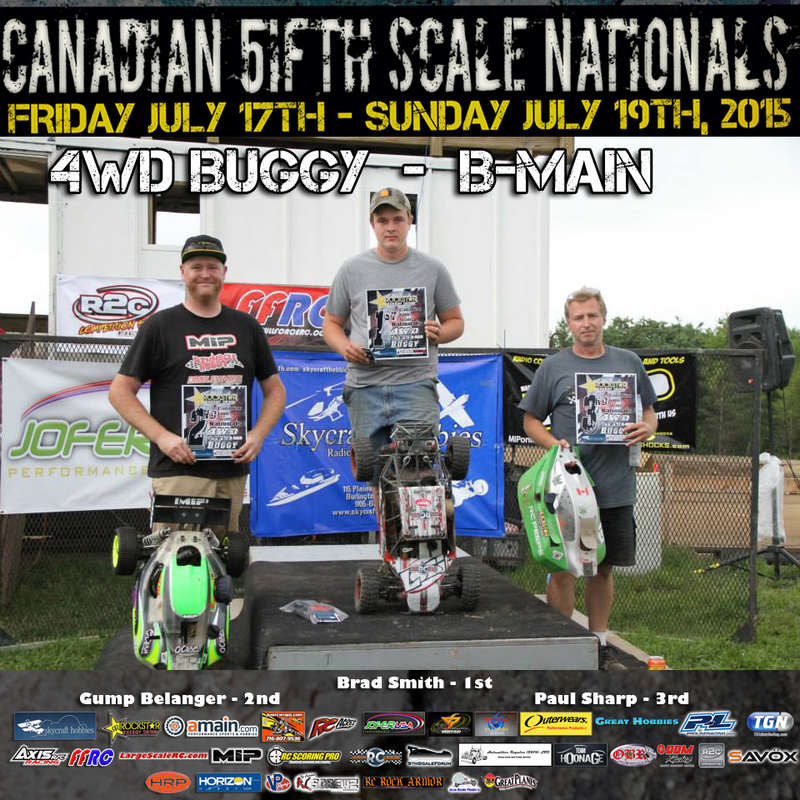 If at any time you need their products or services, please patronize those that made the 2015 Canadian 5ifth Scale Nationals a possibility! 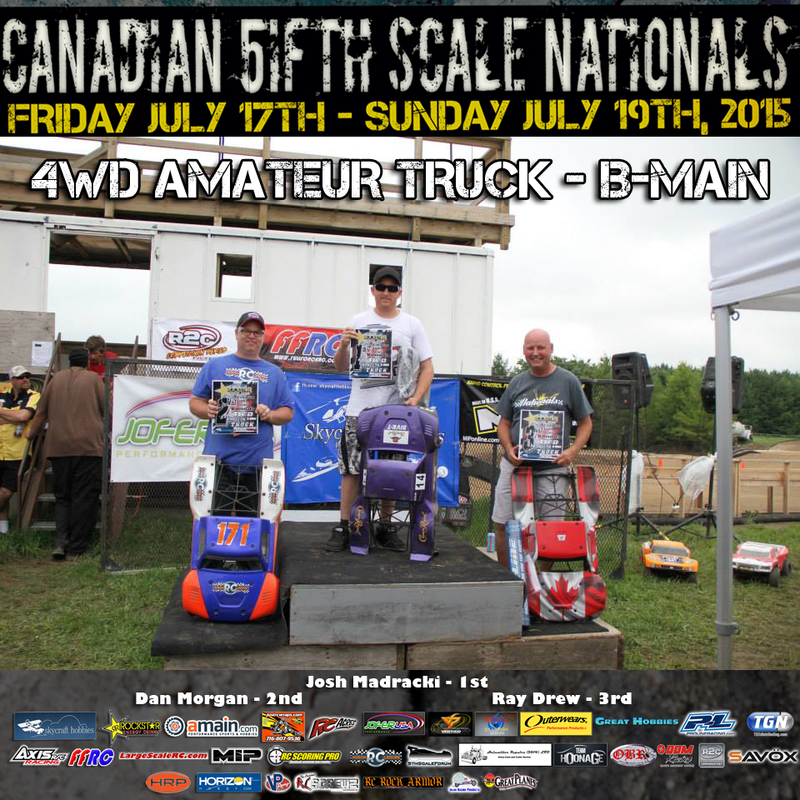 Introducing... the Limited Edition: 2015 Canadian 5ifth Scale Nationals T-Shirt! 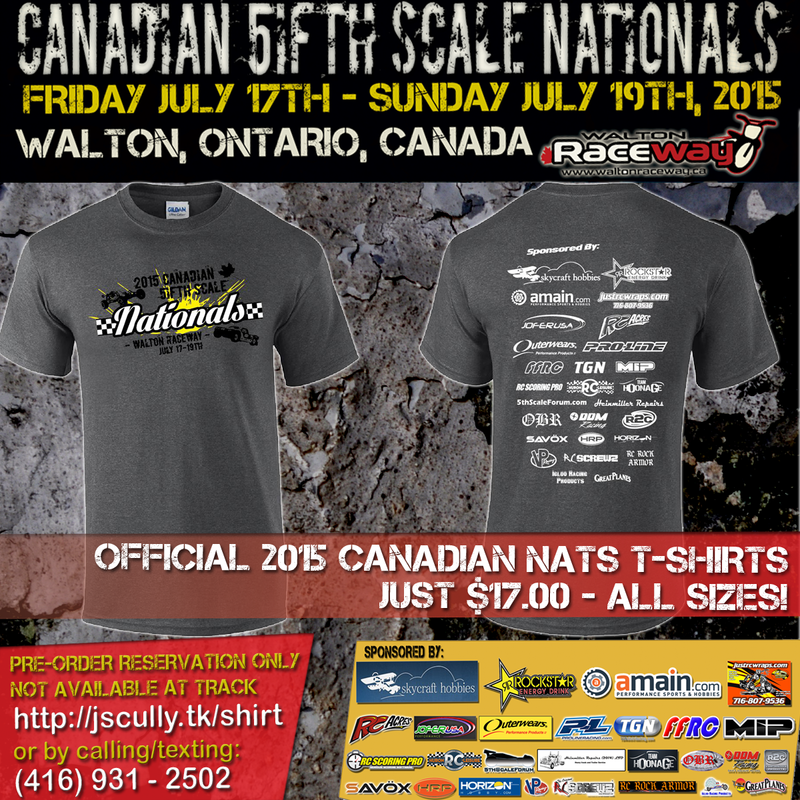 Grab your T-shirt commemorating Canada's Largest 1/5 Scale Race on one of the World's Largest Tracks. All Sizes Available, just $17.00 Per Shirt! THERE WILL BE NO EXTRA SHIRTS AT THE NATIONALS... IF YOU WANT ONE, YOU MUST PRE-ORDER IT. Deadline is Tuesday, July 8th to Pre-Order. 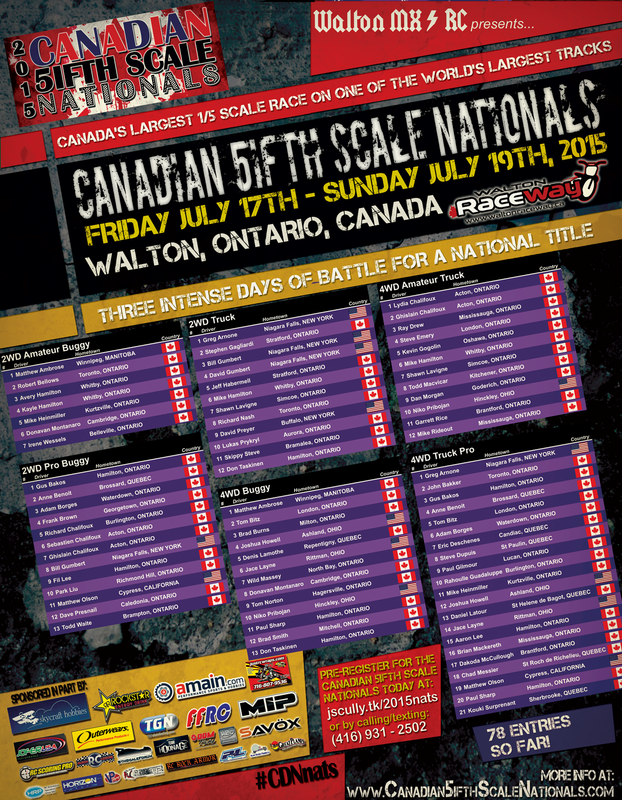 And we're there... 100 Entries for the 2015 Canadian 5ifth Scale Nationals​! 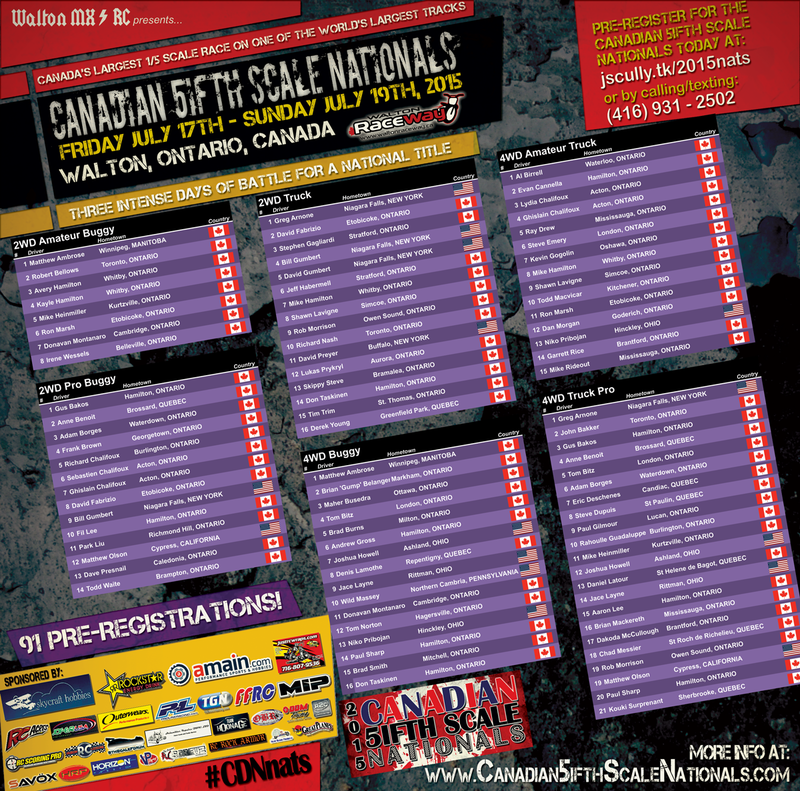 If you're attending the National and you're not on this list... get registered today at http://jscully.tk/2015nats (RC Signup) or http://jscully.tk/2015natsform (Google Form) or email: scully@joescully.com driver name, hometown, Class(es) or text 416.931.2502 with driver name, hometown, Class(es). We're up to 103 Pre-Registrations! We'd like to thank the following 31 Great Companies for their support of the Nats! It's going to be like RC Christmas all weekend long! 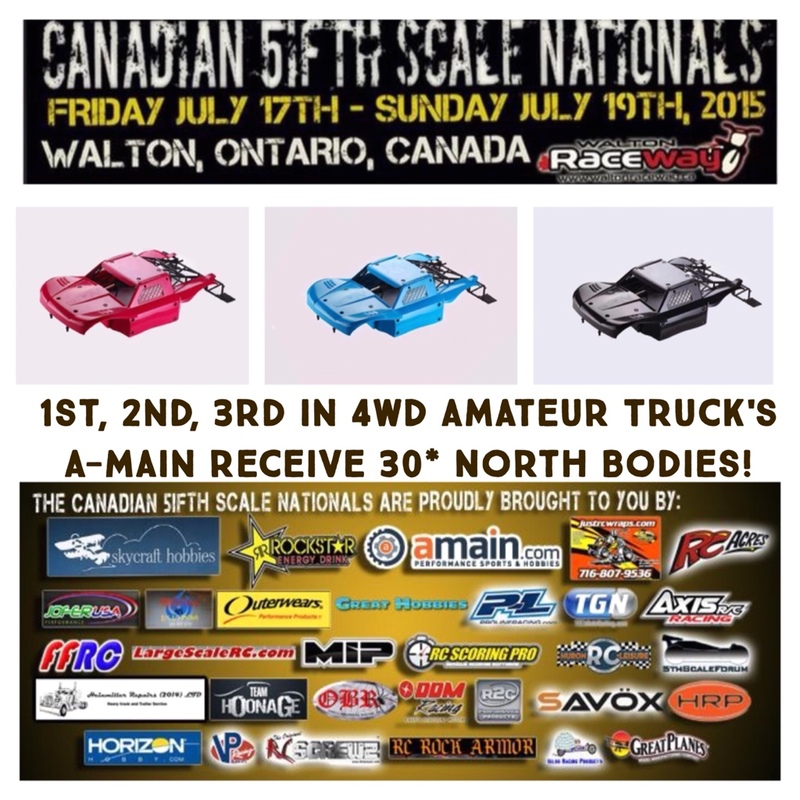 1st, 2nd and 3rd in the A-Main of 4wd Amateur Truck at the 2015 Canadian 5ifth Scale Nationals​ will win a 30* North Body from Hurricane Art R/C​! We're aiming for an 8am Drivers Meeting / Update. Depending on Track Conditions, we're aiming to start our seeding practice at 8:15, followed by a Qualifier and Moto #1 on Saturday. 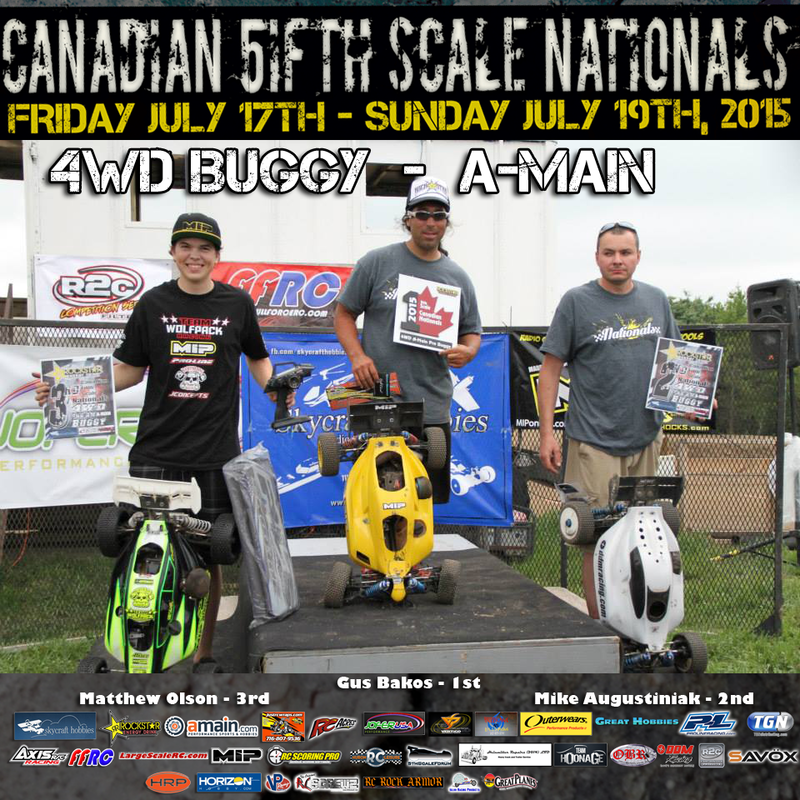 The 2015 Canadian 5ifth Scale Nationals are a wrap, and this year was bigger and better than the year before! 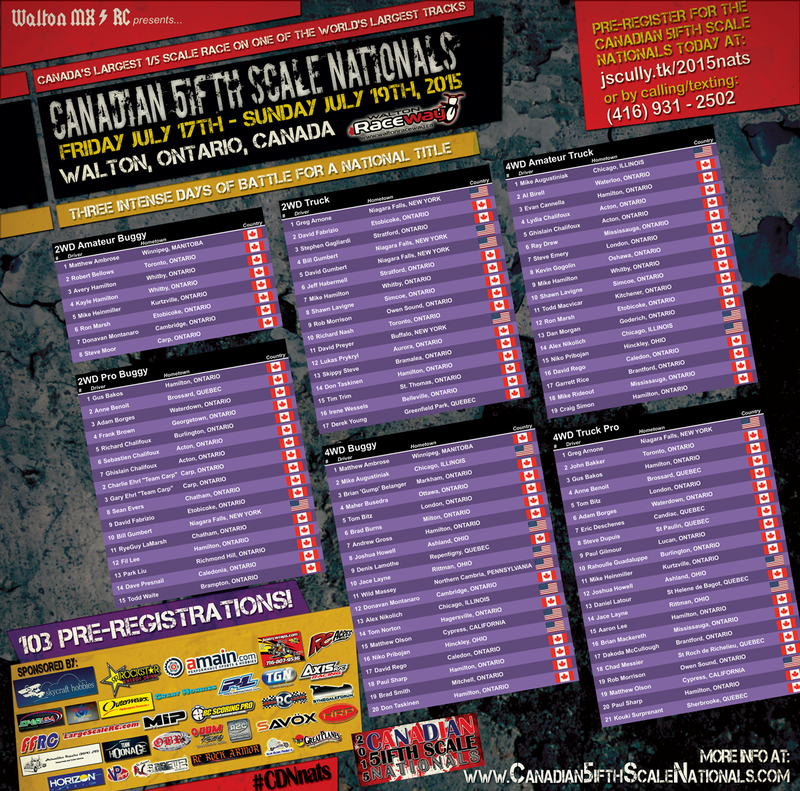 Our official tally was 104 paid and run entries, beating our previous record for the LARGEST ever 5ifth Scale Race in Canada, plus 31 sponsors with product and financial support, over 6 hours of open practice Friday and 50 races over the course of Saturday and Sunday. 4 States (California, Ohio, Illinois and New York) and 3 Provinces (Manitoba, Quebec and Ontario) battled it out for National Championships over the course of the 3-day event. Kudos to Tom Bitz, Steve Emery, Gilly, the Lee family and the Walton Race Crew for the grounds being in great condition (and warmer showers). The feedback on the new layout was that it was nothing short of phenomenal. 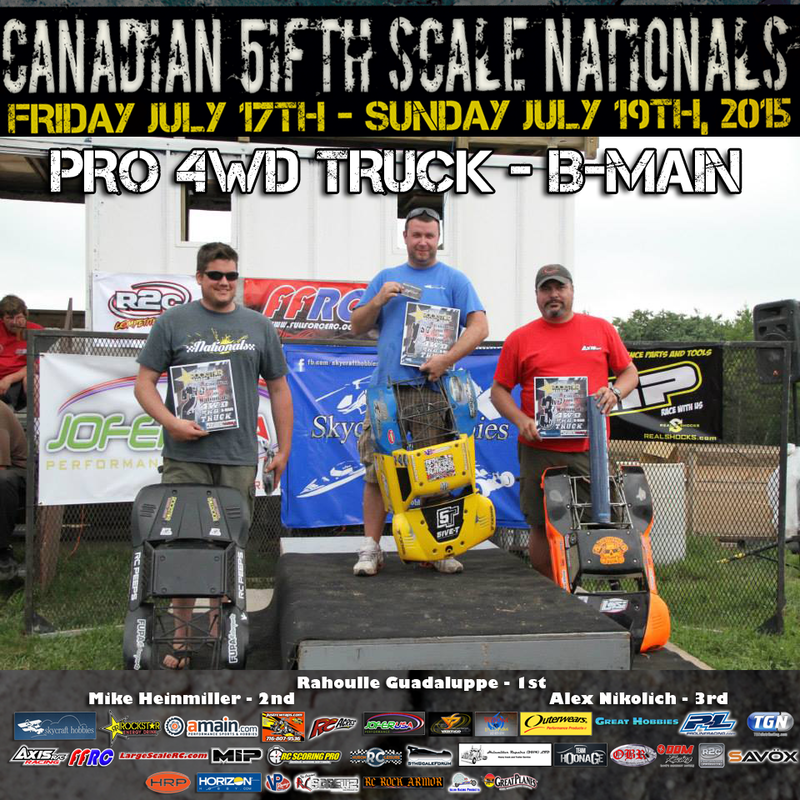 Just like the last big 5ifth scale race this month, PowerJam Worlds, Rain played a huge factor in scheduling. Thursday Night through Friday Afternoon rain pelted the track, forcing a delayed start to practice. The Walton team shuffled the practice schedule, and we were able to offer 6 hours of practice with a little rain break in between on Friday afternoon/evening. With Rain in the Forecast for Sunday afternoon, the schedule was altered to drop a qualifier and run a moto on Saturday. More rain came early Saturday Morning, but we were able to start only a little later than re-scheduled, and more showers came just after qualifying during the re-sort� and stopped once they were posted. This ultimately allowed for great traction and zero watering breaks, and we squeezed in our entire re-scheduled Saturday schedule slightly ahead of projections. Into Championship Sunday, we watered before starting and didn't have to water all day� the racing was hot, and we were done on the track at 12:30pm. Following our podium and awards, we hosted a "Pro-Am Team Last Man Standing" for a purse of over $750 thanks to sponsorship by RC Acres, and the top-team was Ray Drew (A) and Mike Heinmiller (P) earning $380 to split. The Clinton Family had the debut of their new Food Truck, and their menu for the weekend had so many amazing choices. Saturday night's beef on a bun was outstanding. The thing I love is going over and being greeted by all of them; it truly is service with a smile, and they are a great part of our family. 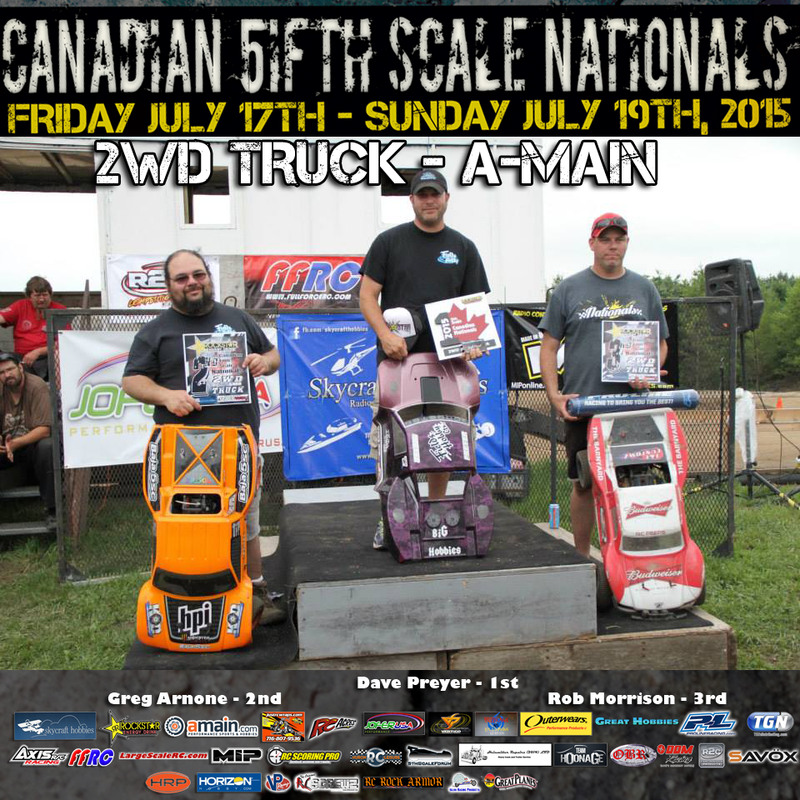 Our thanks to all of our volunteers, racers, and thank you Andrew and Kevin at Skycraft Hobbies. Andrew locked down 80% of the Sponsors and Kevin held down the fort while Andrew was with us for the weekend (thankfully... I didn't want to cut up the raffle names). Plus, thanks to the fans that attended, and the amazing Sponsors (Skycraft Hobbies, Rockstar Energy Drink, Amain.com Performance Sports & Hobbies, Just Signs and Designs / Just RC Wraps, RC Acres Club, Jofer, Vertigo Performance, Hurricane Art RC, Outerwears, Great Hobbies, PRO-LINE Racing, Axis RC, LargeScaleRC.com, Full Force RC, TGN Distributing, MIP, RC Scoring Pro, Huron RC & Leisure, 5th Scale Forum dot com, Heinmiller Repairs, Team Hoonage, O'Neill Brothers Racing, Dave's Discount Motors, R2C, Savox, HRP Distributing, Horizon Hobby Distributors, VP Powermaster Powermix, RC Screwz, RC Rock Armor, Igloo Racing Products and Great Planes) that supported with product and financial support. 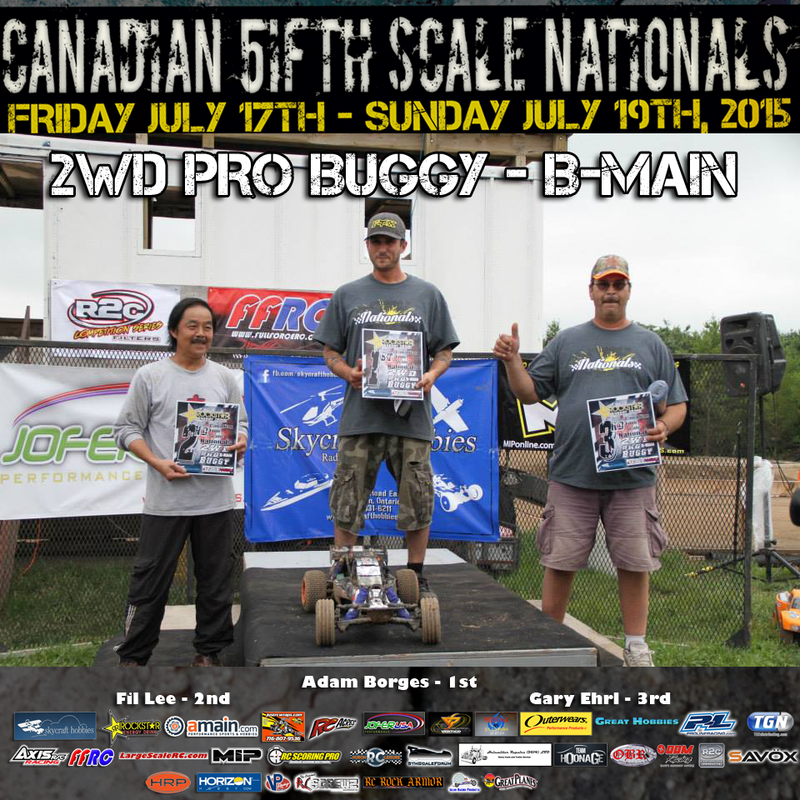 Check out the latest episode of RCTV Online with their coverage of the Canadian 5ifth Scale Nationals; it's outstanding! Please share with your friends, family, fans and stalkers on your favourite Social Networks. 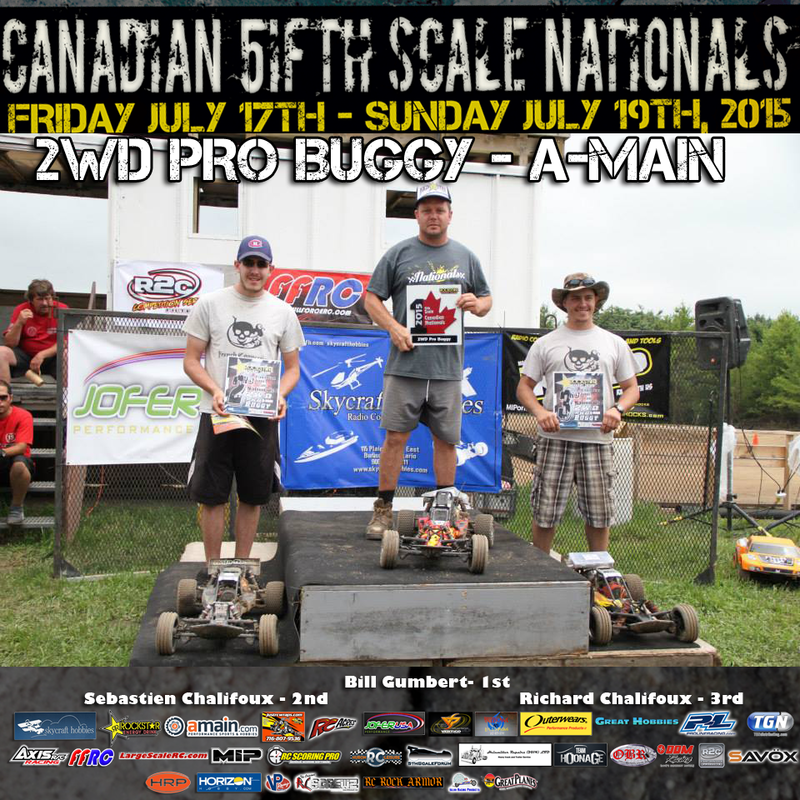 1/5 Scale RC Truck and Buggy racing at it’s utmost finest: check out the epic recap video by KpopRC from the 2015 Canadian Fifth Scale Nationals at Walton Raceway in Walton, Ontario. There’s some killer carnage, and some great high speed battles captured in slow-motion in gorgeous 1080p HD, stitched together in a story that shows the camaraderie between this international motorhead community, and how a record-setting 105 entries were able to wait out the weather and work in the track for some epic racing on a July weekend in Canada. The course was grand scale as ever, providing big air and drifting turns. We can’t wait to go back!